A friend of mine unexpectedly lost her much-loved horse, Ace, to severe colic this week. This post is in his honor. Ace was rescued from a local livestock auction when he was a yearling. His rescuer asked around and managed to find out a bit of his history and his breeding. Turned out his sire was an Andalusian and his dam was a quarterhorse, so she set out to acquire the necessary documentation and get him registered as an American Azteca. Lacking some of the finer details such as specific birth date, she arbitrarily gave him April 1 as his birthday and named him Ace Ventura. He not only lived up to his name but also his assigned birth date, and never outgrew either! He came to live with my friend when he was around two years old, I believe. Ace was a beautiful, kind and charismatic prankster, and far too intelligent and athletic for his own good. My friend really had to “up” her horsemanship skills to keep up with this special horse, but his antics always kept her laughing, and he proved to be a solid and reliable, and much admired, trail companion. Ace’s person and I met through our shared enthusiasm for Iberian horses. My own much-missed Oporto was a purebred Lusitano, Portuguese cousin to the PRE (Pure Spanish horses, sometimes known as Andalusians), and at the time we met there weren’t many Spanish and Portuguese horses around where we live. So the loss of Ace has really hit me hard, too – he felt like extended family to me. It almost feels like the end of an era. It was overcast and there wasn’t much happening in this corner of the marsh the day I captured this image. 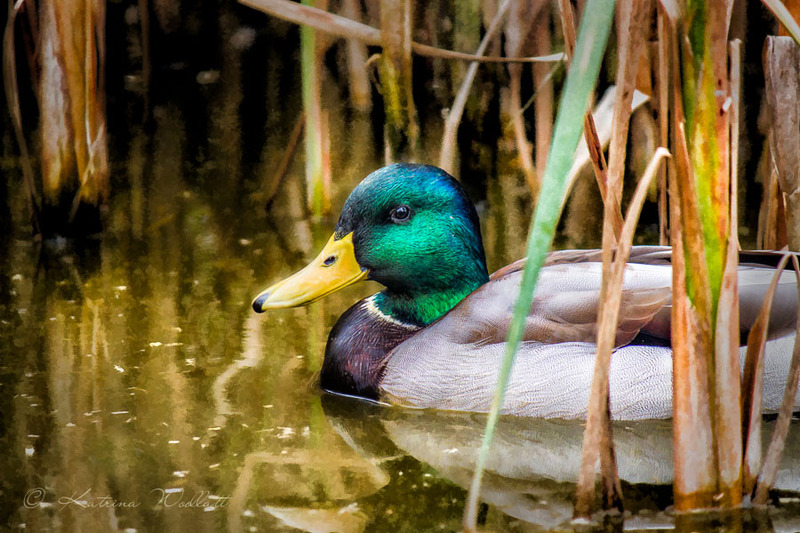 Most of the ducks were snoozing, and this mallard drake was resting in the cattails by himself. His iridescent green head really stood out among all the shades of brown in his immediate surroundings so I decided to add yet another mallard portrait to my collection. 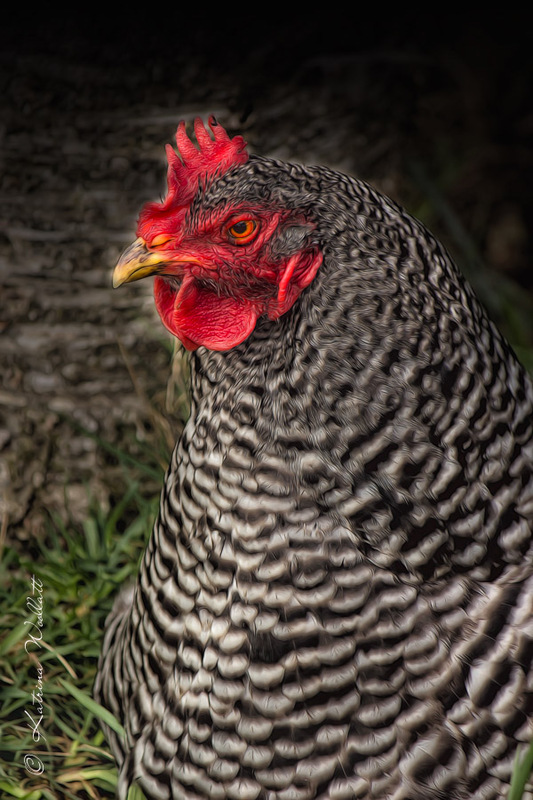 I captured this image last summer, when this lovely hen was resting in the grass in a corner of her compound. Artists seem to love painting chickens, I guess the color of their combs contrasting with their feather colors are just irresistable. I like to photograph them because of all the interesting textures in their face area and the beautiful feather patterns. Tucked away in the shade in a corner of the back yard, under the trees, are some bleeding heart plants. I love how they catch brief touches of the sun when it’s shining and the way the light is filtered through the mantle of leaves overhead, the way it was today. It makes me acutely aware of how relatively quickly the sun is moving, even though it’s not obvious, as I barely have time to set up my tripod before the light has moved off the petals, and the opportunity has evaporated. I was out at the migratory bird sanctuary last week, and got to see and photograph up close a trumpeter swan…a first for me! They don’t usually hang out in the sanctuary. I was very excited. He was gliding around in the long slough that runs alongside the entry road, just inside the sanctuary gates, and didn’t seem bothered at all by the attention he was getting from me and a couple of other visitors. When I paid my entry, I commented about the swan to the attendant, and she said he’d been there for three days, and hoped he wasn’t hurt because the rest of the swans had now departed the surrounding area for points north. When I got home that night, and downloaded my day’s photos onto my computer, I went immediately to the swan captures. I think I’m not mistaken in thinking this poor guy is hanging around because he’s having trouble flying — it looks to me as if his flight feathers have taken a real beating! I had noticed when watching him that he kept refolding his wings, as if they didn’t feel right to him. In the stretch image, you can really see how many of his feathers are lacking vanes, or at least have really ratty looking vanes. I can’t help but wonder how he ended up like that. Hopefully, he didn’t suffer any injury as well. If he’s otherwise okay, and doesn’t go for walkabouts, he at least is in a safe place until his new feathers grow in. At this time of year there should be plenty of aquatic plant material for him to eat, there are a couple of cultivated fields adjacent to the slough (inside the sanctuary) for him to meander around, and if he swims up to the other end of the slough he will find the parking lot and lots of visitors happy to give him some grain. He looked so elegant and regal swimming around in the slough, I do so hope he’s going to be okay. More pink flowers. Tulips this time, each with a different treatment. Time for some more creative blurs. This pair of images was captured while visiting a nearby equestrian centre. I intentionally moved the camera while shooting in combination with a slow shutter speed to achieve the effect. I particularly like how this technique can produce ‘ghosting’ in parts of the image.